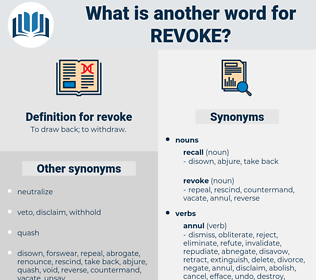 What is another word for revoke? To draw back; to withdraw. ending, overrule, waive, terminate, dismiss, override, nullify, lift, quash, invalidate, discontinue, suspend, retract, vacate, Eliminating, revisit, delete, reconsider, scrap, disqualify, abort, negate, withhold, abandon, undo, dismantle, retire, overthrow, deprive, supersede, forgive, reject, disallow, recover, suppress, cease, dissolve, waiver, void. enforce, stay, validate, remain, ratify, claim, enact, admit, permit, construct, corroborate, fix, acknowledge, accept, pass, create, allow, sanction, approve, build, affirm. initiate, begin, introduce, engage, support, set up, cherish, promote, repair, take on, promise, sustain, pledge, revive, legalize, reinstate, start, establish, continue, restore, keep, confirm, commence, institute, undertake, authorize, renew. Endurance for a few more months, on the best terms he could secure, lest the old madman should even yet revoke his gifts; and then - a transformation scene - on the details of which his thoughts dwelt perpetually, by way of relief from the present. But this was disallow'd; And I shall sooner wear a winter shroud Than thou revoke my doom of banishment. ravish, raffish, Rubus Caesius, ripsaw, rabies, raphus, rhapis, revise, refocus, Rebozo, rubus, ribes, ribhus, rubbishy, ravage, rapacious, rebus, rebecca, refuge, reface, rbc, roebuck, rebekah, rib cage, rear back, roof peak, rebuke, Rara Avis, repossess, refugee, refuse, rooibos, repechage, repose, ravehook, rubbish, ribose, rhibhus, rubiaceae, reap hook.